The STEEM price is up 6.25% verse the USD over the past 24 hours on lower volume ($12,463,400) as Bitcoin rises to $8.8k and the broader market is up on the recovery. 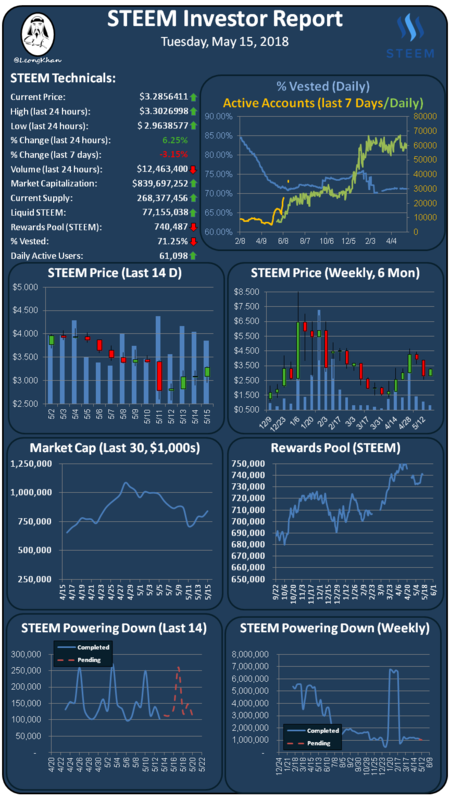 STEEM is gaining ground verse Bitcoin as Korean trading continues to lead the trading volume with 44% of the trading volume. New account creation is strong with 1,400 new accounts created in the past 24 hours. The % vested indicator is down slightly at 71.25% on steady power downs and lower power ups. Daily active accounts is up at 61,098 accounts executing transactions in the last 24 hours. SBD is at $2.64 on Bittrex which is still very elevated over the peg, receive you rewards in 50% SBD and then use the SBDs to buy STEEM on the exchange. SBD conversions are a waste of money again!